Her name was originally B’sst which became Ubaste, then Bast, then Bastet; the meaning of this name is not known or, at least, not universally agreed upon. Geraldine Pinch claims that “her name probably means She of the Ointment Jar” as she was associated with protection and protective ointments (115). The Greeks associated her closely with their goddess Artemis and believed that, as Artemis had a twin brother (Apollo) so should Bast. They associated Apollo with Horus, the son of Isis (Heru-sa-Aset) and so called the goddess known as Bast ba’Aset (Soul of Isis) which would be the literal translation of her name with the addition of the second ‘T’ to denote the feminine (Aset being among the Egyptian names for Isis). 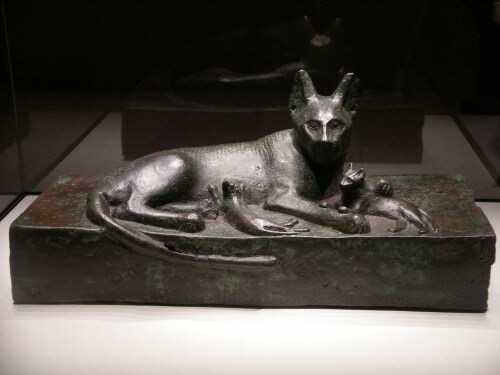 From the Pyramid Texts onward, Bastet has a double aspect of nurturing mother and terrifying avenger. It is the demonic aspect that mainly features in the Coffin Texts and the Book of the Dead and in medical spells. 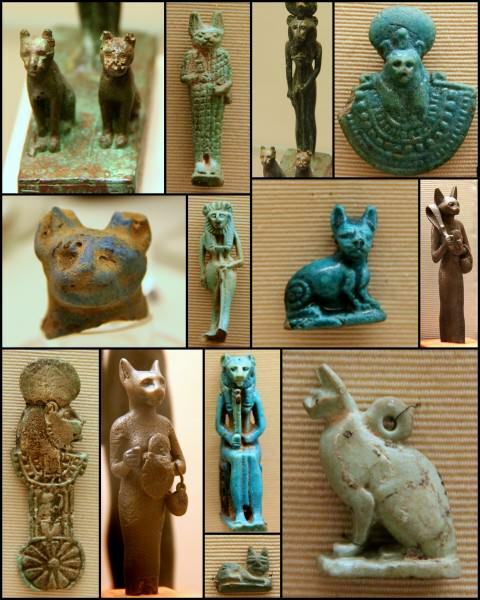 The “slaughterers of Bastet” were said to inflict plague and other disasters on humanity. One spell advises pretending to be the ‘son of Bastet’ in order to avoid catching the plague (115). 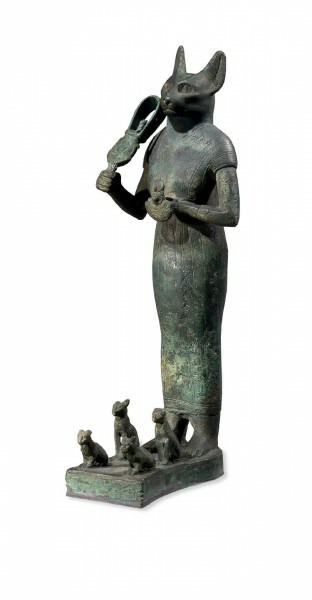 BASTET IS SOMETIMES RENDERED IN ART WITH A LITTER OF KITTENS AT HER FEET BUT HER MOST POPULAR DEPICTION IS OF A SITTING CAT GAZING AHEAD. 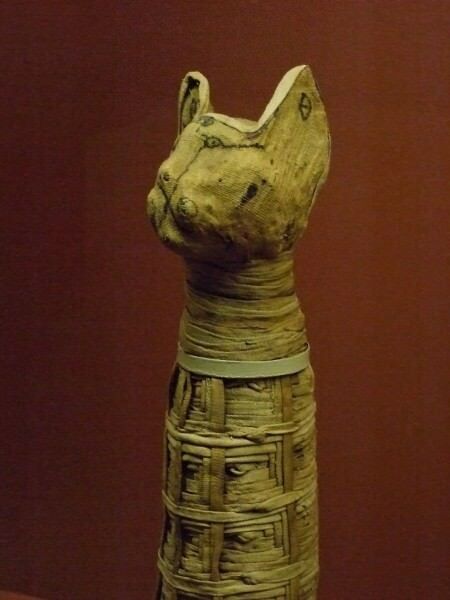 In her earliest known form, as depicted on stone vessels of the 2nd dynasty, Bastet was represented as a woman with the maneless head of a lioness. The iconography of the goddess changed, however, perhaps as her nature began to be viewed as milder than that of other lioness deities (178). Although scholars disagree on who Taboubu represents, her close association with Bastet as the daughter of one of the goddesses’ priests makes this deity a very likely candidate. The predatory nature of Taboubu, once she has Setna where she wants him, is reminiscent of the cat toying with the mouse. Geraldine Pinch concludes that Taboubu is a “manifestation of Bastet herself, playing her traditional role of punisher of humans who have offended the gods” (117). In this story Bastet takes on the form of a beautiful woman to punish a wrong-doer who had violated a tomb but the story would also have been cautionary to men who viewed women only as sexual objects in that they could never know whether they were actually in the presence of a goddess and what might happen should they offend her. The goddess’s popularity grew over time and in the Late Period and Graeco-Roman times she enjoyed great status. The main cult centre of this deity was the city of Bubastis – Tell Basta – in the eastern Delta, and although only the outlines of the temple of Bastet now remain, Herodotus visited the site in the 5th century BC and praised it for its magnificence. 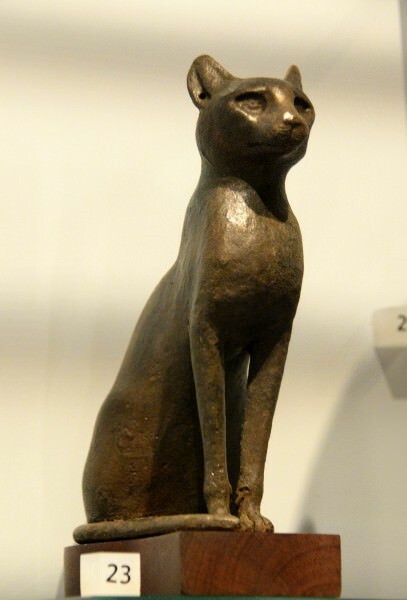 The festival of Bastet was also described by Herodotus who claimed it was the most elaborate of all the religious festivals of Egypt with large crowds participating in unrrestrained dancing, drinking, and revelry (178). Amulets of cats and litters of kittens were popular New Year gifts, and the name of Bastet was often inscribed on small ceremonial `New Year flasks’, probably to evoke the goddess as a bestower of fertility and because Bastet, like other lioness goddesses, was viewed as a protective deity able to counter the darker forces associated with the `Demon Days’ at the end of the Egyptian year (178). I discovered your blog site on google and check a few of your early posts. Continue to maintain the very good function. I simply additional up your RSS feed into my MSN News Reader. Hunting forward to reading more from you afterwards!? You should get involved in a contest for a few of the top sites on the web. I will recommend this site!